All the I-M223 members are indicated by Family Tree DNA as being related at the 37 and 67 marker tests. (Those who have tested at 111 markers are likewise related.) Matrices showing the genetic distances at 37 and 67 markers are shown below. With any group of related y-DNA matches, the modal or most common value for each STR is the presumed STR value for the most recent common ancestor (MRCA). This presumes that the matches all generally inherited the y-DNA of the MRCA, except where mutations occurred. 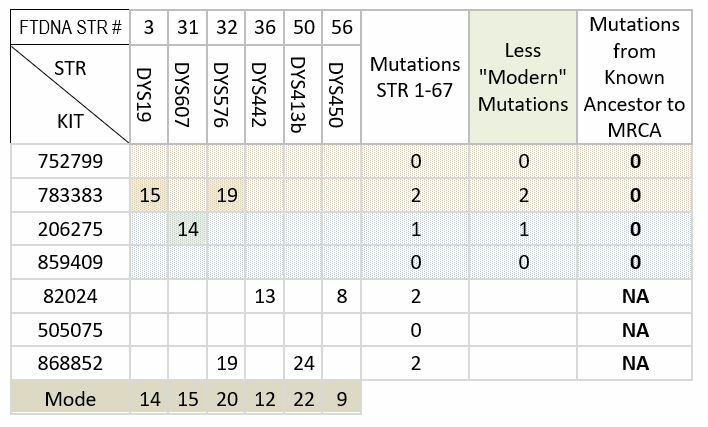 Charts showing these mutations, or differences from the mode, for each member at 37, 67, and 111 markers are shown below. Matrices below show the genetic distance between each member and the number of mutations of each member to the MRCA. At least two pairs of cousins exist amongst our members. By comparing the STR mutations of cousins to the modal values, one can tell if a member’s mutations occurred before or after the intermediate ancestor (the ancestor the cousins have in common.) This discussion is below. Some family lines mutate faster than others which makes it difficult to estimate time to the MRCA based on genetic distance. See below for more information. Sometimes a mutation on a marker might show a difference of two steps compared to the mode or others. How is genetic distance calculated in this case? See below. Some STRs mutate faster than other STRs. If a mutation occurs on one of these markers it may not be an indication of the passage of many generations. Some researchers disregard the fastest mutating STRs when doing analysis. 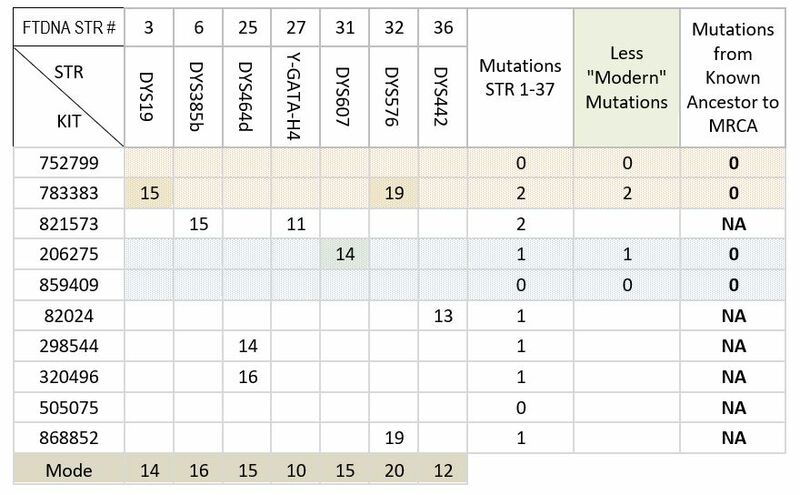 Charts showing the member’s differences from the mode disregarding the fast mutating STRs at 37, 67, and 111 markers are shown below. This analysis implies the possibly these members are even more closely related than thought. A hypothetical descendancy tree from the MRCA is shown below. The following charts are genetic distance matrices at 37 markers and 67 markers for the I-M223 members of the Ralston Project. These matrices show that these members are all related to each other. Note: Although 206275, 821573 and 783383 show as “not related” at this level to a few others, they are still included in the group because they are related to other members of the group. Note: At 67 markers, 206275 and 783383 are now in the “Related” category for all other members. Totals are shown for the number of mismatches to the mode or mutations since the MRCA for each group of tested markers. The totals ranch from 0 to 4, the 4 being one member at 37 markers. “Modern Mutations”, shaded in green, are explained in the section “Cousins” which will follow. Note that at 67 markers all are 0 to 2 mutations from the MRCA, except 783383. 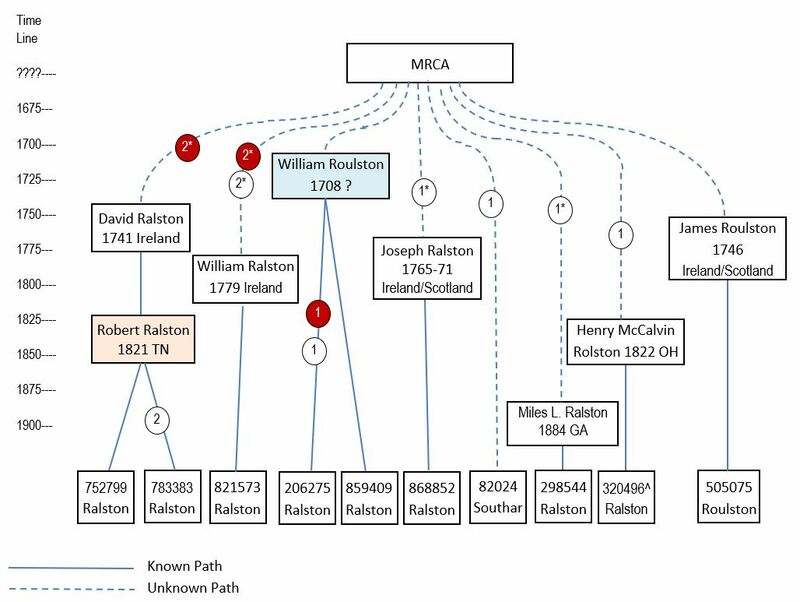 However, 783383 is a second cousin once removed of 752799 (more on that following) so the actual distance to the MRCA can be adjusted for recent mutations to match that of his cousin at 2. The other cousins, 206275 and 859409, have a common ancestor from the early 1700s. They show no mismatches in common, so they inherited no mutations from their common ancestor. Both of these cousins had three “modern mutations” that occurred after their common ancestor, because where one cousin had a mismatch, the other retained the original value for that marker. Their common ancestor was closely related to the MRCA of the group (0 mutations after deducting the “modern mutations”). Theoretically, it would be possible to determine if two members of the group are closer related (closer cousins) than to the rest of the group (if there are enough generations between the cousins’ ancestor and the group MRCA for mutations to have occurred) by observing where they agree on mismatches. However, other than 752799 and 783383, who are known cousins, there no obvious situations among our current members. 821573 matches 783383 on one mismatch, but this mutation of 783383 was from a known intermediate ancestor, not in the lineage of 821573. Likewise 868852 matches 783383 on a “modern mutation”. Both these are coincidental. This analysis shows that there is a benefit in cousins (the more distant, the better) being y-DNA tested and being part of a surname project. By having one or more cousins to compare against, it can be determined if the genetic distance to the MRCA is from recent mutations or are from many generations back. If testing is done for more than two cousins, with generations between common ancestors, it should be possible to also determine if mutations occurred between the two ancestors. An interesting observation regarding 868852 is that on STR DYS413b he shows a value of 24, whereas all others in the group have a value of 22. So did this happen as a result of two mutations, one to 23, then another one later to 24? Or did this happen in a single event? Is this one genetic distance or two? There are different models that count it either way. FTDNA counts it as one “difference”, therefore one genetic distance. For more information see https://dna-explained.com/2016/07/27/y-dna-match-changes-at-family-tree-dna-affect-genetic-distance. Many of the mutations in the I-M223 group occurred in the STRs that frequently mutate. With the exclusion of just these four highly mutating markers, the genetic distance appears to be much closer, with 2 or fewer mutations at 37 and 67 markers, and 3 or fewer at 111 markers. In addition to STR testing there are also benefits to be gained from SNP testing to further narrow a member’s haplogroup. In the I-M223 members, a few have further tested to show they are I-L623. Because all these members are closely related, that would indicate that all of the I-M223 members can be further refined to I-L623. Further, a close match to all the I-M223 members has a Big-Y test that indicated he is I-PH3906. One of the I-M223 members as now also done Big-Y testing which proves he is, in fact, I-PH3906. His results are being further analyzed at yFull.com. Having others to do this testing would also help further analysis. It was already apparent that all the I-M223 members are related, descending from a common ancestor. This analysis supports that and implies the possibly these members are even more closely kin than thought. * It is undetermined if this mutation occurred before or after the intermediate ancestor (white box). ^320496 has a cousin not in the project, but based on data obtained from the cousin’s matches, the single mutation occurred prior to Henry McCalvin Rolston. The tree above shows seven lines back to the MRCA. Unless our MRCA, Mr. R_lston, had eight sons from which each of these lines descended, that is incorrect. It is more likely these lines descend from a few of Mr. R_lston’s sons, who would be intermediate ancestors, and/or perhaps grandsons or great grandsons. Whoever the intermediate ancestors were, as stated previously, they were close enough for there to have been no mutations in their y-DNA.